The tragic loss of Robin Williams has recently brought attention and awarenss to a topic sensitive to many, suicide. As mental health professionals, we know the importance of suicide awareness. With the conversation started, let’s keep it going. 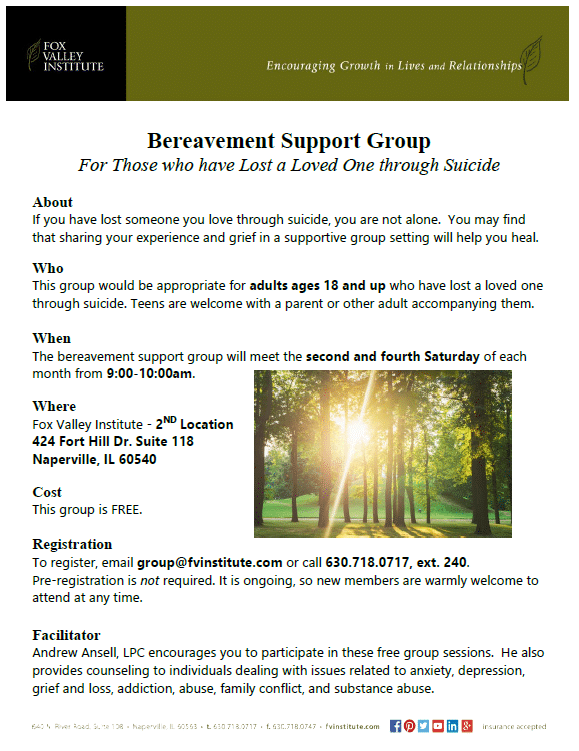 Please take some time to read the following article written by a survivor of suicide, followed by information on what Fox Valley Institute has been doing to support survivors of suicide. If you have lost someone you love through suicide, you are not alone. You may find that sharing your experience and grief in a supportive group setting will help you heal. The group will meet the fourth Saturday of each month from 9:00-10:00am. This is an open format so new members can register at any time. Andrew Ansell LPC will be facilitating the group. Andrew encourages you to participate in these free group sessions. He also provides counseling to individuals dealing with issues related to anxiety, depression, grief, and loss, addiction, abuse, family conflict, and substance abuse.